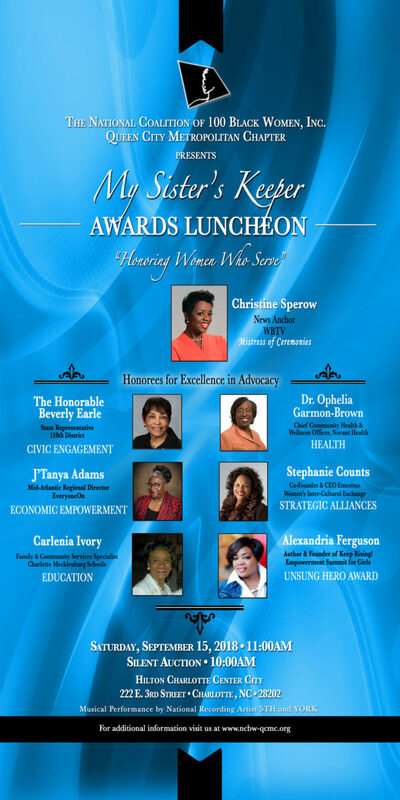 Charlotte, NC – The 2018 My Sister’s Keeper Awards Luncheon—Honoring Women Who Serve returns for its fourth year and is presented by The National Coalition of 100 Black Women Inc., Queen City Metropolitan Chapter (NCBW-QCMC). The luncheon will be held on September 15 from 11:00 a.m. until 2:00 p.m. at the Hilton Charlotte City Center and will be hosted by WBTV News anchor Christine Sperow. This is NCBW-QCMC’s signature event and serves as the organization’s largest fundraiser of the year. Additionally, Alexander Ferguson, who is the anchor and founder of Keep Rising Empowerment Summit for Girls, will receive the “Unsung Hero” award for her vast accomplishments and service to the community. Guests can expect an opportunity to network and participate in a silent auction. Doors will open at 10:30 a.m. and the luncheon will begin promptly at 11:00 a.m. Money raised from the silent auction will go towards the scholarship fund and supporting programs including a mentoring program, Building Bridges to Success, which gives young women ages 12-17 with the opportunity to recognize their full potential by offering educational, developmental, and cultural events related to health and wellness, leadership, personal and career development. The event will also feature live musical entertainment by national recording artists 5th and York. Tickets are currently on sale; to purchase, visit www.ncbw-qcmc.org. For all media inquiries or to schedule an interview with event organizers, contact Jameka Whitten at 704.965.3297 or jameka@jswmediagroup.com. 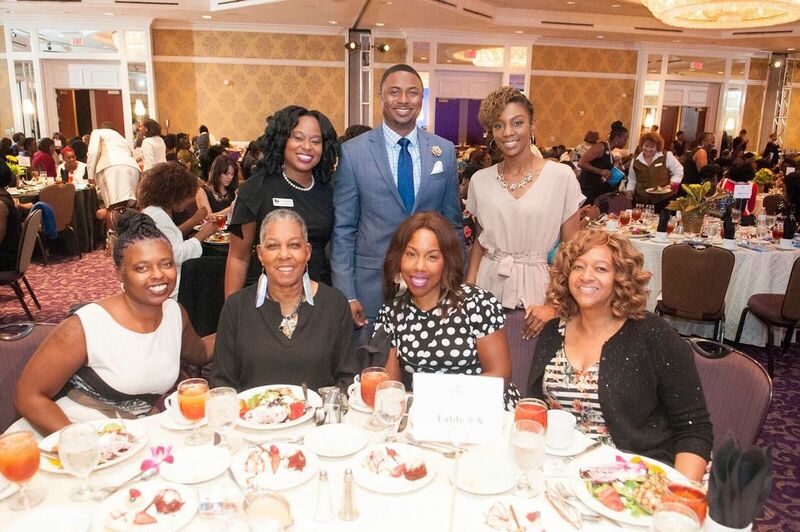 The National Coalition of 100 Black Women, Inc., Queen City Metropolitan Chapter is a non-profit organization that advocates on behalf of women and girls of color. The organization focuses on empowering women to be leaders in their community and careers. The Coalition serves as a change agent through advocacy work to influence public policy that promotes gender equity in health, education and economic empowerment. www.ncbw-qcmc.org.